With 60 percent less fat than regular potato chips, you'll love the bold and zesty flavor of this snack mix. 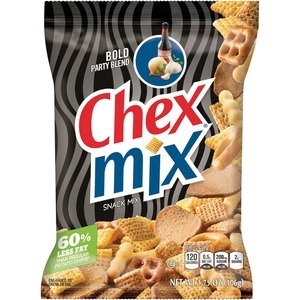 Each single-serve bag offers a crunchy combination of Corn Chex, Wheat Chex, pretzels, rye chips and mini breadstick bites for a satisfying treat that's great any time of day. Snack mix is perfect for on-the-go enjoyment, having a quick bite at your desk, serving at company gatherings and more.